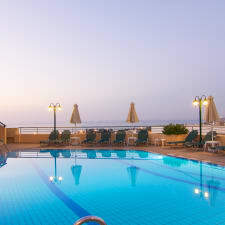 Radamanthy's hotel-apartment is located in Sfakaki area, in the suburbs of Rethymnon, just 10km east of the old Venetian town of Rethymnon (almost in the center of Crete). It’s built on a small hill, near the north seacoast of Crete, just 150 meters from the main road of Crete and 350m from the nearest “Golden beach” beach, 150m from the tavernas, supermarkets, etc. The complex consists of four buildings, three including the apartments while the fourth main building contains the reception, the lobby, the bar and the roof garden. Right in front of the bar there is an impressive pool and the relaxation area. The complex owns a spacious parking lot. The property consists of 15 luxury, fully furnished apartments, 11 one-bedroom apartments, 3 two-bedroom apartments and one studio. All apartments feature a fully equipped kitchen (Fridge, Electric ceramic Hobs, kettle, coffee machine, toaster, pots, dishes, etc. ), individual A/C, safe,plasma TV 32”, hairdryer, satellite TV (9 channels) and free wifi access for all residents, everywhere the property. Each apartment retains the privacy (private entrance and balconies).The view across the area from each apartment is unique.